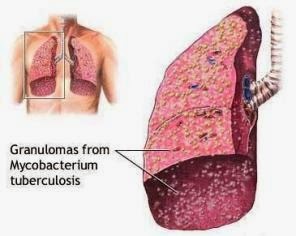 TB most commonly affects the lungs, but can affect almost any part of the body. It can be spread when someone with the infection coughs, sneezes or talks and another person breathes in the bacteria. However, prolonged contact is usually needed for infection to occur. Some people develop a minor infection, which then settles as their immune system fights it and evidence is only found later incidentally as a scar on a chest x-ray. For others, active TB flares up many years after the initial infection. If the initial infection isn't fought off, it can progress to serious ongoing infection a few weeks after the first contact. It's estimated that one-third of the world's population is infected with the bacteria that causes TB. Each year about nine million people develop the disease and up to nearly two million people worldwide are killed by it. Figures from the Health Protection Agency show there were 8,417 cases in the UK in 2007. Anyone can get TB. • Those who have a weakened immune system because of other medical conditions, such as diabetes, or because of other medical therapy, such as immuno-suppressant medication. TB is difficult to treat - normal antibiotics don't kill TB bacteria. Combinations of several special antibiotics treat the infection in the majority of cases. These must be taken for long periods, usually at least six months, to avoid becoming ill with TB again and developing a drug-resistant form of the disease. Even with treatment, some people develop long-term complications from infection. Travelers to countries where TB is prevalent are at greater risk. A vaccine is available, which is offered to those at high risk of contracting the disease. Check with your doctor whether your travel plans put you at risk of TB and discuss possible vaccination.